Click here to order this encyclopedia from Amazon.com. 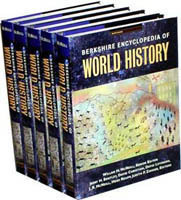 The Berkshire Encyclopedia of World History is the first true encyclopedic reference on world history. It is designed to meet the needs of students, teachers, and scholars who seek to explore -- and understand -- the panorama of our shared history of humans. Anyone who loves history -- including those who are making history today -- will find this work an endless source of fascinating, thought-provoking coverage of events, people, patterns, and processes. The encyclopedia was developed by an editorial team of over 30 leading scholars and educators, led by William H. McNeill, Jerry H. Bentley, David Christian, David Levinson, J. R. McNeill, Heidi Roupp, and Judith Zinsser. Its 550 articles were written by a team of 330 historians, archaeologists, anthropologists, sociologists, geographers and other experts from around the world. I contributed segments on Julius Caesar, Augustus Caesar and Napoleon Bonaparte.